Elvis Enthusiasts Unite: Real life Nacho Libre. Nobody’s going to ask me what my luchador experience was like. It all happened in one of those blurs people like to mention. And, you know, I’m betting nobody will ask me about the delicious $1 liver and chile relleno tacos I had for breakfast on Friday morn. I doubt the local band that outdid the Lizard King himself on his own “Love Her Madly” will ever even come up in conversation. That goes, too, for the bacon-wrapped hot dog I inhaled from the hot dog stand, the one that tasted so much better at night than it felt in the morning. The luchadors, though, were an altogether new beast for me. I want to remember the experience as best I can. One thing led to another, it did. We went from wandering into a tiny shop with various wrestling masks on proud display to learning there’d be a match just hours later to a taxi cab driver dropping us off on a dirty street in downtown Mexico City, the same place Spanish-only-speaking scalpers tried earnestly to sell us tickets at double the listed price. We did buy them. Eventually. It was “only” 200 pesos to get us ringside, which sounded like a good idea and price and what-not. There was more wandering after that, but more for perfect masks (Dan scored a nice horned number with a fat cross in the middle of the forehead) and shelter from the surprise rain and occasional driver out for blood. And, as the shops began to line the street outside the Arena Mexico, it became more and more clear what kind of cash cow the whole operation was. 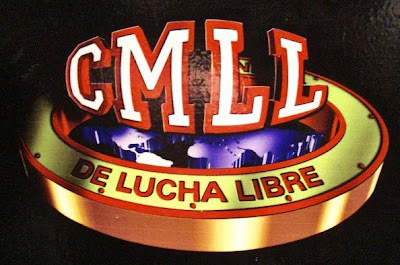 Whether it was luchador masks, plastic figurines, glittery bandanas or a fancy red beanie (too bad its one size fits all did not quite fit), there were some serious pesos being spent. Getting into the arena I’ll chalk up to that whole magical stroke of luck part. Initially, the security cronies wouldn’t let us inside, as we had cameras and it was against their rules to actually grant us the very same privileges the Mexican press had. We mentioned we were with a magazine in the USA and had tried to call to request permission ahead of time, but nobody answered (both truths). Phone calls were made, text messages were sent and we waited, waited and continued to wait until some kind PR woman showed up and saved our hides. She took us inside, granted us permission to snap from a certain row (an even better one than the scalper had promised to us) and told us we could even shoot in a room just outside the locker room. I believe that, at this point, there was a collective sigh of relief. That, or mine was just extra loud. I don’t know that I can ever properly explain what it was like to be at the match. I suppose it was a bit like the WWF back in America (I’m not entirely sure which came first), though it was almost a little disconcerting to see seemingly ordinary fans in the crowd, patiently waiting for the match to begin ... only with a full vinyl head mask over their heads. The vendors sold big expensive beers and popcorn and even Cup ‘o Noodles to the hungry, but they sold masks as well. 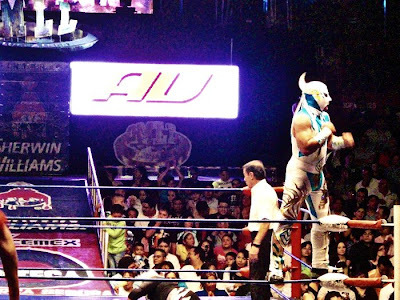 Horns were constantly blown and whistles blasted and names of luchadors yelled out (in between the actual Spanish swear words being shot out right above me) as the night unfolded, a combination of theatrics, precision, face makeup and sweat. Lots and lots of sweat. That match counts as some of the fastest three hours of my life, methinks, but we left with some grins, we did. When the taxi driver lucky enough to take us back to our hotel charged us double on account of the time (it being somewhere close to midnight), I didn’t even mind. Much. Who knew colored masks and spandex could account for so much of the happy on my part? Certainly not me. Oh, just when you thought you had been to every country and seen everything. . . .wow, I'll be that was quite the experience. I had to laugh at the bow they took with midget-monkey-man.